I’m quite partial to a cake, especially carrot cake. And I make a very good apple, date and walnut cake that may well be the death of me. That’s if the walnut and sour cherry chocolate brownies don’t get me first. So bribe me with anything cake-like and there’s a good chance I’ll do pretty much anything for you. Except ironing. I hate ironing. But a blog post? No problem. I have absolutely no blogging morals whatsoever when it comes to cake. 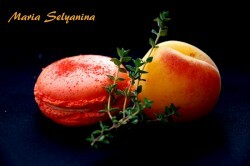 Maria Selyanina’s French Macarons are the Best Goddamn French Macarons I’ve Ever Eaten! Fact! There, I’ve done it. Banished from the Blogging Hall of Fame forever (is there one even?). But seriously though, all immoral blogging aside, they are pretty damn good. Even though, truth be told, they are actually the first ones I’ve ever tasted. I’ve never fancied them in the past. I’ve seen them in Bubo in the Born. Funny little burger-like things that are so brightly coloured they look like something a small child wouldn’t come down from for weeks. Give me a good bit of cake any day. Or even a coconut macaroon – now that’s a proper macaroon surely – not one of these funny French macarons. But I was wrong. They are great. Soft, slightly crisp meringue with the gorgeous almond paste inside that reminds me of the best almond cake I ever had down in Andalucía. But this stuff is better. It’s practically spreadable. I want it by the jar! White chocolate and vanilla, passion fruit cream with little sesame seeds on top, green tea (matcha), apricot and thyme – all fabulous. So who is Maria Selyanina? 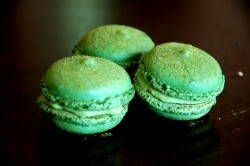 And how can I get me some of these macarons? Though I’m sure I’ll never be requiring anything else, and her ‘star product’ is the French macarons, these aren’t all she does. Maria makes all kinds of cakes, tarts and what to me look like the yummiest chocolate logs I’ve ever seen. All lovingly handmade without using any dodgy preservatives. Which just means you have to eat them quicker. You can order for any type of gathering you wish to have where indulging in cake is allowed which as far as I’m concerned is the only type of gathering I wish to go to. 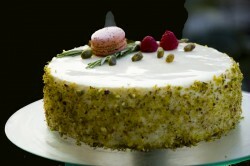 You can even order a unique cake made to your exact requirements. So I have ordered a cake-sized macaron. Maria comes from Russia. With a lot of love. If you like cake. Or want to impress someone who likes cake. I would definitely get in touch. They will love you for it. UPDATE: Since writing this I have tried the French macarons at La Colmena, a patisseria on Plaça Àngel next to Jaume I metro, and frankly they were rubbish, which is a shame because otherwise it’s a very lovely place. P.S. If anyone else wants to bribe me with cake or anything else one can consume please don’t be shy. 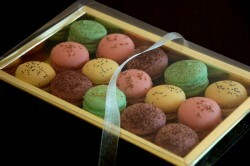 How amazing that macarons can come in any flavors. I’ve already heard of macarons with bacon in America! I wonder how they compare with Laduree’s. I follow Maria’s Russian blog, and as far as I know, she is the entire enterprise! She bakes everything herself :-) Isn’t it awesome?! Hi Adele, Maria does produce some amazing creations yes.